Our practice is currently co-owned by David Mason, who took over ownership in 2005 having worked at the practice since 1977. David maintains that the veterinary profession was a natural choice for him as he grew up around animals; one of his grandfathers was a farmer and the other a stud groom. From school age David was fascinated by science and biology and knew he wanted to spend his working life caring for animals. 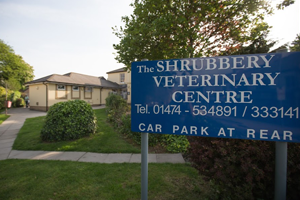 While working at The Shrubbery Vet, David was a vet for Radio Kent for five years and is also a former chairman of the Petsavers charity committee. The practice itself – a former vicarage – has previously hosted a Radio Kent live broadcast, and was one of the first veterinary practices in the country to be filmed for Sky TV! Natalie Devleeschouwer is the other co-owner, and has worked at the practice since 2011. As Clinical Manager she is responsible for ensuring that our high standards are always maintained. Our team of staff all share the same passion for animals and determination to provide the best possible service and treatment to every client who visits the practice. Between them they have a wealth of specialist experience, including ultrasound, endoscopy, acupuncture, dermatology, internal medicine and cardiac medicine. As the owner of six tortoises, all of whom were previously strays, David also has a particular interest in tortoise care! We would love to meet you and your pet, and look forward to seeing you in practice very soon. For more information about us, or to book an appointment, please feel free to call us on 01474 534891. We would love to meet you and your pet, and look forward to seeing you in practice very soon. For more information about us, or to book an appointment, please feel free to call us on 01474 534891.